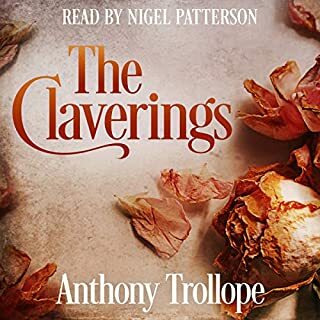 When Louis Trevelyan's young wife meets an old family acquaintance, his unreasonable jealousy of their friendship sparks a quarrel that leads to a brutal and tragic estrangement. Trollope's classic novel features Reverend Septimus Harding, the elderly warden of the Barchester alms-house. However, for a man devoting himself to helping the poor, Reverend Harding's salary is rather lucrative. Aiming to ease his conscience and quiet his neighbors' whispers, he decides to divest himself of all the income he earns at the alms-house. But this decision causes unforeseen complications. The first of his Barsetshire series, this novel provides a detailed, gently satirical portrayal of 19th century British life. 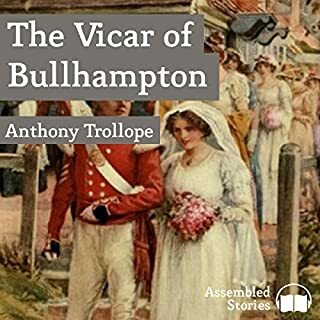 This comprehensive novel consists of three subplots which interlink to form the whole and supply a trio of targets at which Trollope aims his proselytising pen. The first treats on the courtship of a woman by a man whom she does not love and with whom she is not compatible. Mary Lowther will not accept such a marriage of dishonesty. The second deals with the plight of a young woman who has fallen prey to the wiles of an evil seducer and subsequently adopts a life of prostitution. 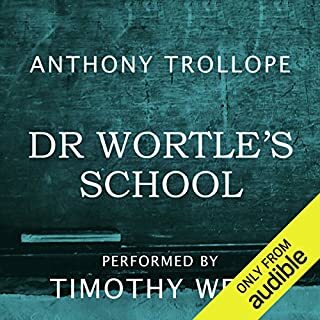 Dr Wortle's School introduces the unassuming Mr. Peacocke and his polite, newly-wed bride, as they join the teaching staff of an elite and exclusive Christian boys' school. Dr. Wortle, a devoted English scholar and the headmaster of the seminary academy, welcomes his two new teachers, confident that they will uphold the high standards of education at the school. What is a Little Bigamy Among Friends? "Orley Farm" is a novel by Anthony Trollope. When Joseph Mason of Groby Park, Yorkshire, died, he left his estate to his family. A postscript to his will, however, left Orley Farm to his much younger second wife and infant son. The will and the postscript were in her handwriting, and there were three witnesses. A bitterly fought court case confirms the postscript. Twenty years later Lady Mason lives at Orley Farm with her son. "Lady Anna" (1874) is a novel by Anthony Trollope. It describes Lady Anna's attempts to resolve the conflict between her duty to her social class and her duty to the man she loves. The story takes place at about the time of the First Reform Act of 1832. Lady Anna is the daughter of the late Earl Lovel. Her mother married him out of ambition, despite his evil reputation. Soon after their marriage, he told her that he had a living wife, which made their union invalid and their unborn daughter illegitimate. "John Caldigate" (1879) is a novel by Anthony Trollope. Excerpt from the book: "It was one of the disagreeable things which he had had to do before he could get away to the gold-diggings, and it was done. Now he had to say farewell to his father, and that would be a harder task. As the moment was coming in which he must bid adieu to his father, his heart was heavy within him. He felt sure that his father had no special regard for him; - in which he was, of course, altogether wrong, and the old man was equally wrong in supposing that his son was unnaturally deficient in filial affection." "Castle Richmond" (1860) is a novel by Anthony Trollope. It is set in southwestern Ireland at beginning of the Irish famine. Castle Richmond is situated on the banks of the Blackwater River in County Cork. The plot features the competition of two Protestant cousins of English origin, Owen and Herbert Fitzgerald, for the hand of Clara Desmond, the noble but impoverished daughter of the widowed Countess of Desmond, providing the novel’s principal dramatic interest. 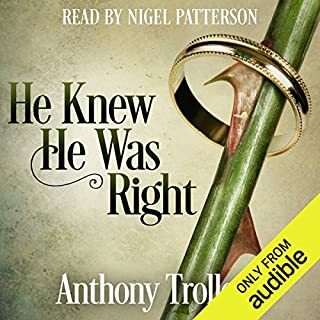 Considered one of Trollope's greatest works, The Way We Live Now leaves the listener questioning whether much has changed in the last century or whether this, after all, is the way we live now. Drawn in by British TV and radio, I've concentrated my Trollope-reading on the Barchester and Palliser series. The Way We Live Now is the first standalone Trollope novel I've tackled. As always, the characters are unique and realistic, few of them all good or all bad. There are four callow young men - Paul Montague, Dolly Longstaffe, Felix Carbury, and Lord Nidderdale (if he has a first name, I missed it) - and although it's easy to get them confused in the beginning, their different personalities soon assert themselves. Of the four, Paul is the closest to being an honorable man, but even he has moral baggage: a woman from America, with whom he lived for awhile and then dropped, has followed him to England and threatens to cause a scandal. Hovering over the proceedings is the brooding figure of Augustus Melmotte, a wizard of finance, who promises to make the fortunes of many but turns out to be the mastermind of a kind of Ponzi scheme. He has a daughter, Marie, who is pursued - for her money - by Carbury and Nidderdale. For the sake of her fortune, they're willing to overlook Melmotte's shadowy past, which includes the possibility that he may be Jewish. Which brings us to another point. There's a fair amount of anti-Semitism depicted in the novel. One subplot, involving another couple, results in tirades of racist invective: it's so over the top and so clearly irrational that it seems to absolve Trollope himself of being anti-Semitic. But the author's point of view isn't always so obvious, and it remains a vexed question. 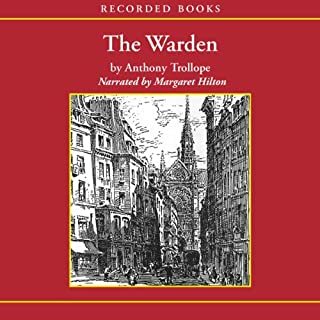 Trollope strikes up conversations with his readers easily and repeatedly, and he never hesitates to tell us what he thinks of his characters; but he never takes the trouble to make himself clear on this one issue. David Shaw-Parker is a wonderful narrator of Trollope who has done all the Barchester novels for Naxos. Long may he continue. He has the knack of capturing exactly the right tone for Trollope - affectionate, amused, clear-headed, and eminently sensible. And he can do a credible American accent as well, which for this novel is crucial. The one thing he can't do is make any of these finely drawn characters endearing. It's a great job, but there aren't any heroes to root for in this one. The book itself is wonderful, but what makes this audiobook stand out is the superb narration by David Shaw-Parker. 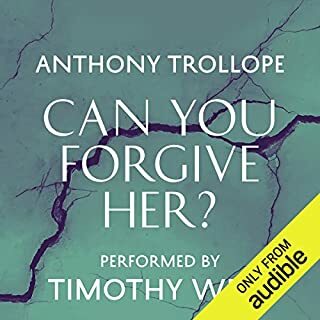 Anthony Trollope is the ultimate comfort read for me. It's like floating on a sea of Victorian storytelling, where everything comes out right in the end. That being said, The Way We Live Now was not always a comfortable book to read. I don't think it would be my first recommendation for people new to Trollope. The characters aren't quite as sympathetic as some (I think the wrong man got the girl in the end) and the length of this is pretty daunting. This novel has some serious staying power/relevance. It first popped onto my radar back in the days of the financial crisis when a couple of people I knew told me that this novel was all too close to the then current story of Bernie Madoff. Fast forward two presidential terms later, when I finally get around to tackling it, and Bernie Madoff is old news. It's not him I see most in Augustus Melmotte, the vulgar nouveau-riche man trying to prove himself worthy in London society. &quot;There was one man who thoroughly believed that the thing at the present moment most essentially necessary to England’s glory was the return of Mr. Melmotte for Westminster. This man was undoubtedly a very ignorant man. He knew nothing of any one political question...He had probably never read a book in his life. He knew nothing of the working of parliament...But yet he was fully confident that England did demand and ought to demand that Mr. Melmotte should be returned for Westminster. This man was Mr. Melmotte himself.&quot;I wish I thought Trollope was psychic. Instead I am afraid that The Way We Live Now may just be the way we are always going to live. One just wishes that Ivanka showed as much strength of character as Marie. What about David Shaw-Parker’s performance did you like? The reader manages many voices and accents without ever letting his performance overwhelm the material. A classic story, beautifully told. Highly Relevant in 2018. The central figure is a wealthy, unscrupulous conniver to whom all London kowtows. The highest and mightiest throw reputations away in pursuit of quick money. It’s 1873...or is it 2018? A great story and the reader did a wonderful job except for the male and female Americans who sounded like Dustin Hoffman. A glimpse into Britain's past, oddly contemporary! Trollope provides a multi-faceted, panoramic insight into British life in the 1860's, complete with politicians who seem eerily like some we have now. It's humorous, engaging, and complex, with many intersecting plots. Being rather old-fashioned, it's a bit rambling, sometimes repetitious.... I skipped ahead a few minutes here and there, when I'd had enough of a particular character. Overall, I enjoyed it right up to the end, where all the various plot threads get resolved. If you have time for such a long book, you like an historical setting, and you don't mind a bit of a ramble here and there, I recommend it. The reader is wonderful.....I'm going to go look for other books he's narrated. This story is a long tome but it is very relevant to our times. I liked the happy ending. The novel has a large number of chacters, and David Shaw-Parker deals with the challenges involved with consummate skill. His pace is just right for a massive novel. 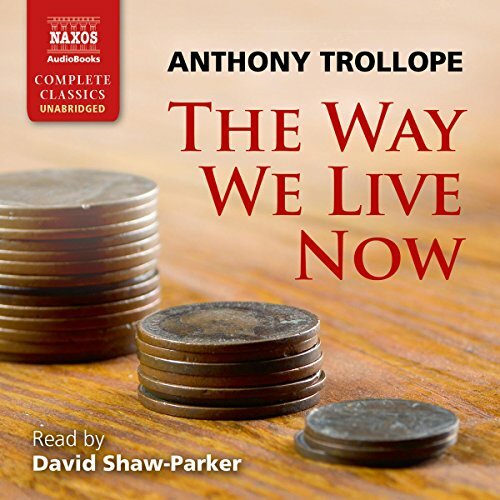 The Way we Live now is regarded as Trollope's masterpiece: this narration is worthy of the great novel. Well read. Good story but a bit repetitive, probably because published originally in monthly parts. You could skim a bit if reading but it might be best for listening if lightly pruned. Mr. David Shaw-Parker's marvellous performance makes Trollope's masterpiece truly unforgettable. The story is told with absolute mastery, with ever so many different accents and voices that every character appears as having a life of its own. Superbly read and typically wonderful Trollope. Brilliant all round, and heartily to be recommended. should be compulsory for all students of English literature. Loved the parallels with today's capitalism. The narrator was a joy to listen to. One of Trollope's best.